Of the 26 letter of the alphabets, we are clearly most familiar with our letter of the week- Q. Because- duh!- Q is for Quentin. Also, we call Quentin “Q” most of the time. Well, sometimes, Q-ball too. So, Q is mighty familiar with the letter Q. And well, Q is really the first letter of the alphabet he ever learnt. Small wonder huh? Because of his familiarity with the letter I had to think of something a little special to initiate this letter of the week and we decided to head to Qian Hu Fish Farm cos, well, the place began with Q. I know, stretching it a little but, we can only try right? 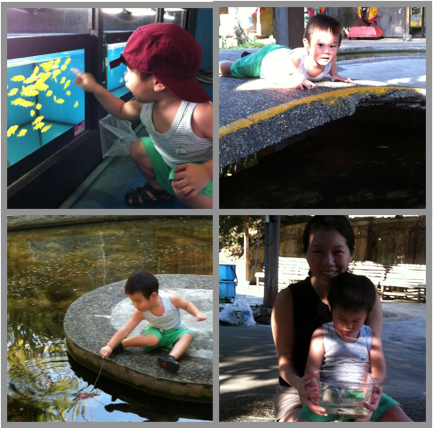 It seemed to work well enough cos he was duly excited to see the big (fake) fishes and so we stopped to chat about where we were and we got him to count the number of “Qs” in the sign and then got, duly, distracted by all the pretty fish in the place. I didn’t have high hopes for the place but it turned out to be a real gem of a day. In particular, we had fun dipping our hand into the fish spa pool- I’m sure we weren’t really allowed to do that but, well, we only did a short spot of that. And spent a happy half hour trying to catch long hang fish; we were dismal in that only catching four tiny things in that time. I blame the net for being too small (its the size of 2/3 of an iPhone). After our day at Q is for Qian Hu Fish Farm, we embarked on our letter of the week craft, making a Q is for Quail and q is for queen. I’m thinking of making a big letter Q with Quentin’s face on it… hmmm… we’ll see. This entry was posted in alphabets, education, Learning Crafts, Letter of the week, Places to visit, Review, Things to do and tagged alphabet, crafts, education, learning, places to visit, Review, things to do by matchingsocks. Bookmark the permalink.